I hope you've all had a great week so far! Mine was really busy. I had to work all weekend and most of the week as well on a work presentation and I was completely beat afterwards. 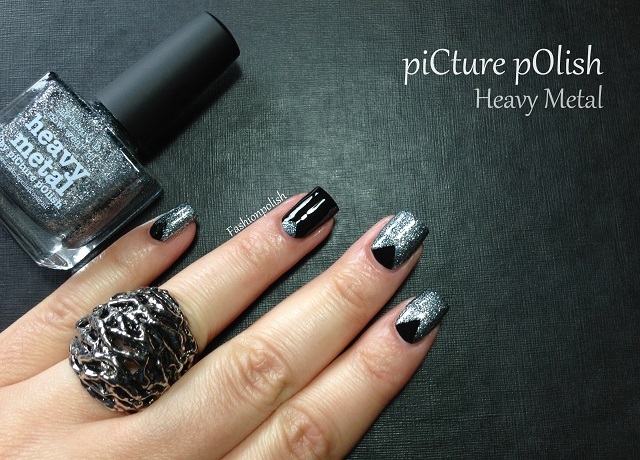 So... Today I have a new piCture pOlish shade to share with you : Heavy Metal! Heavy Metal is a sheer grey base literally packed with very fine gunmetal glitter, really dense and ultra sparkly, right up my alley! Formula was on the thick side but manageable and dried to a smooth finish. I used 2 thin coats here with a triangle half moon design and a reverse accent on my ring finger. piCture pOlish Heavy Metal retails for AU$10 and can be purchased directly from piCture pOlish.com.au or through their international network. Wow!! Very pretty color and combo. Uau, adorei a cor e a decoração!! !